Has a month really passed already? Time keeps flying by, and I want it to slow down! 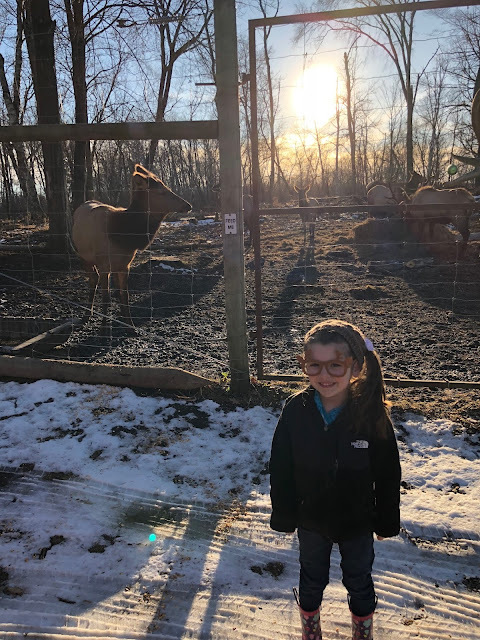 These posts are a lot of work to put together, but I have been really enjoying taking a look back at all the things I have done over the past 30 days or so. It's fun sharing a bit more personal side of my life than just the outfits I wear. This month was a particularly fun one with holiday activities, family visits, and Aveline's first Christmas! I haven't had the time or energy to read much, but I finally finished a triology I started back in July (review of first book here). Apparently the wait list at the library was a lot longer than I thought! With all that has been going on, I thought a bit of chick lit and easy reading would be a good option. Because these were in a series, I will just do a combined review. While book 1 wasn't on my 'must read' list, it wasn't horrible enough for me to not finish the trilogy. The love stories weren't terribly engaging. I liked the first 2 the best and found them to be the most realistic. The restoration of the inn was the most interesting and then the storyline of continual restoration of the town's buildings became a bit repetitive. I mean seriously, how many buildings need to be renovated in that town?! And does every character need to be a business owner? The ghost story became a little dull towards the end, too. It might just be that I am used to more excitement and history woven into books I choose. Hope is in charge of the Montgomerys’ Inn BoonsBoro, and Ryder is constantly underfoot while working on some new Montgomery construction project, so they need to find some way to maintain a professional working relationship. Yet whenever Hope and Ryder cross paths, the best she can expect from him is a kind of surliness. But when Hope’s romantic past in the form of her old lying, cheating boyfriend, Jonathan Wickham, comes to BoonsBoro with an offer he believes Hope can’t refuse, Ryder proves to be an unexpected ally. Now Hope finds herself reassessing Ryder in a new and quite possibly romantic light. 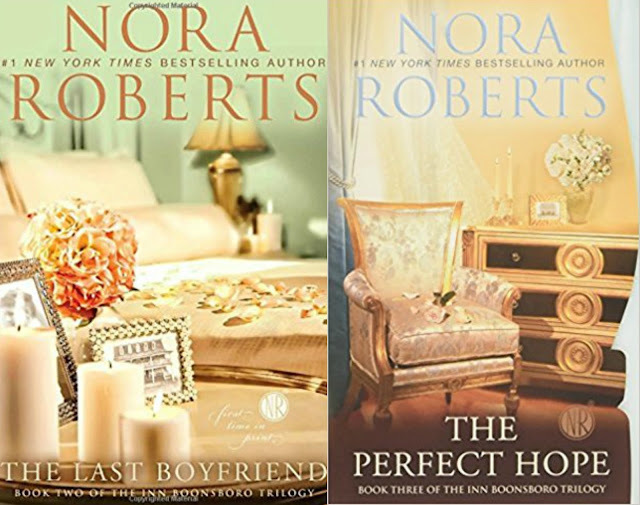 This last book in the trilogy finds the final Montgomery brother with his perfect romantic counterpart but also resolving the mystery of Eliza Ford, the ghost haunting the inn. We made a few new recipes this year for Christmas cookies and this was one of them. Claire loved helping by unwrapping the Andes Candies and putting them in the dough. We ended up melting the leftover Andes Candies and just dipping the tops of the cookies in the melted chocolate. They turned out beautifully and were really tasty! You know those recipes that make a lot, only take a little time, and are delicious? This is one. I doubled the batch, used a bag of dark chocolate chips and white chocolate chips each, one full box of candy canes, and made it in a 9x13 pan. And I had a huge tin of peppermint bark fudge after 20 minutes. Winning! I had picked up some amazing cherry jam this fall that was just waiting to be used. Since I am not a big toast or PB&J fan, this was the perfect recipe for it! It was another one my daughter liked helping by rolling balls and making the thumbprints. If she can do the work that I find tedious I am all for it! This was a recipe I featured on the blog this month. My husband went back for seconds and has been asking when we can make it again! Another easy blog recipe I shared this month. I love my crockpot meals. They make life so much easier! I received this from Influenster to try out. I am pretty loyal to Aussie 3 Minute Miracle and have been using that for years and years. Although I have tried other conditioners that I have liked, I keep going back to Aussie. So I am always skeptical trying a new one! This L'oreal balm is really thick, has a nice scent, and leaves my hair just as soft as Aussie. It's in the same price range, too. Only time will tell about the damage though. I have only been using this a few weeks now, but so far I like it and will definitely continue to use it. I received Neostrata's Foaming Glycolic Face Wash through Brandbacker to try. 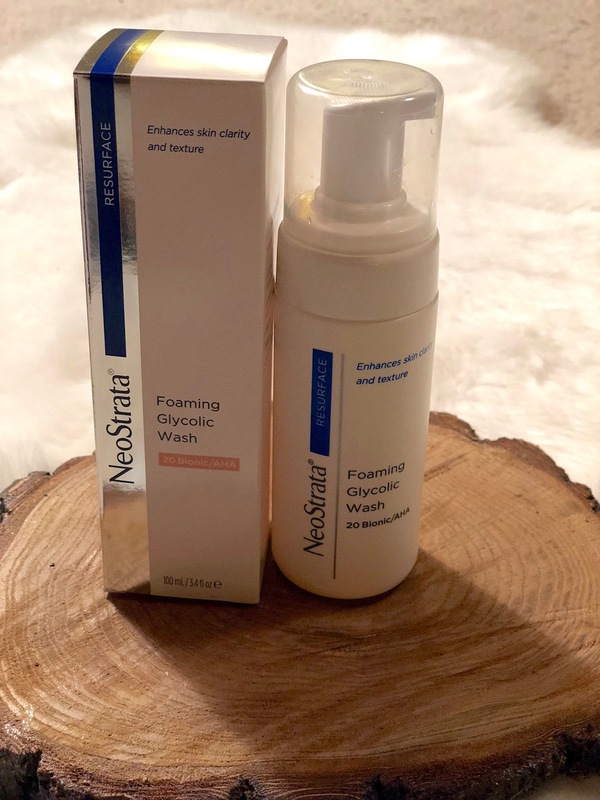 I have tried Neostrata products before and liked them. You can see what I have tried and my thoughts here, here, and here. Neostrata has a passion for developing the very best in anti aging physician grade skincare. Neostrata works to create highly effective formulations with results that are proven by rigorous studies. Each product is backed by the highest standards of quality and effectiveness. This face wash is designed to help gently exfoliate and smooth skin texture with its potent, pH-balanced, foaming formula. It is ideal for experienced Glycolic Acid users who prefer a deep cleansing, this soap-free, fragrance-free, dye-free, and paba-free face wash contains 18% Glycolic Acid and 2% Lactobionic Acid to help enhance exfoliation. It is designed to help unclog congested skin and prepare the skin for optimal benefits of the skincare routine you use following its use. I do not consider myself an experienced Glycolic Acid user, but I do like the clean feeling my face has after washing it with this. To use it simply wet your face, pump the cleanser into your hands and apply to your skin. Cover the area and rinse with water. 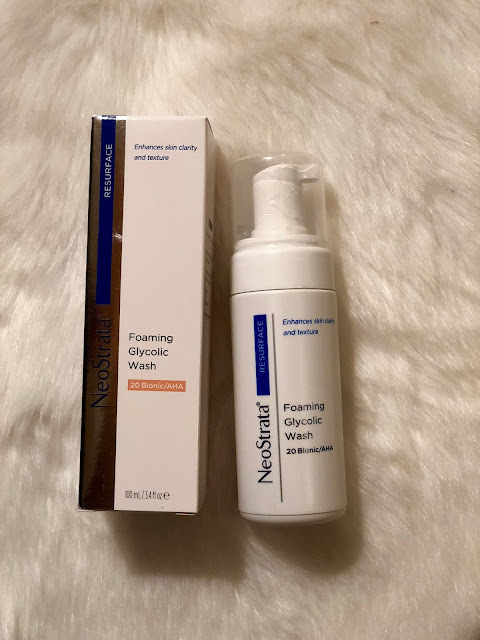 I have been using it AM and PM after removing my makeup, but if my skin feels a bit dry I do skip it and use my other face wash to give my skin a break. If you have very sensitive skin, I could see this irritating it, especially if you use it twice a day. I have not been getting much sleep lately (#newborn) and my skin tends to look dull with lack of sleep. After using this a week, I feel like my skin is brighter and more smooth. Although the price point is a little higher, a little goes a long way, especially being a foam cleanser, this will probably last me a few months at least! 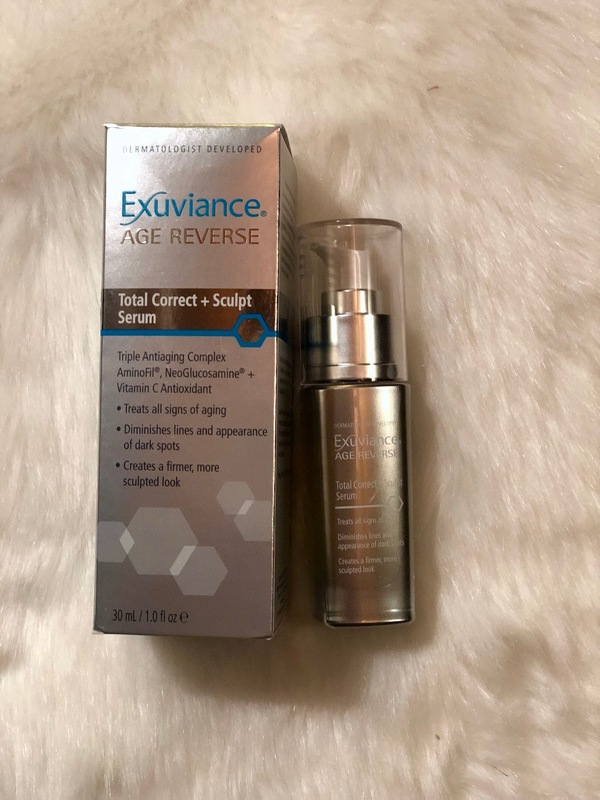 Previously I have tried the Exuviance Cleanser (you can find my review here). I am actually still using it because I like it and a little goes a long way so it hasn't run out yet. After liking the cleanser so much, I was really looking forward to trying this serum. If you aren't familiar with the Exuviance brand, it was created by doctors who are widely recognized in the field of cosmetic dermatology. They discovered the antiaging benefits of Glycolic Acid and created and patented the first Glycolic Peel. 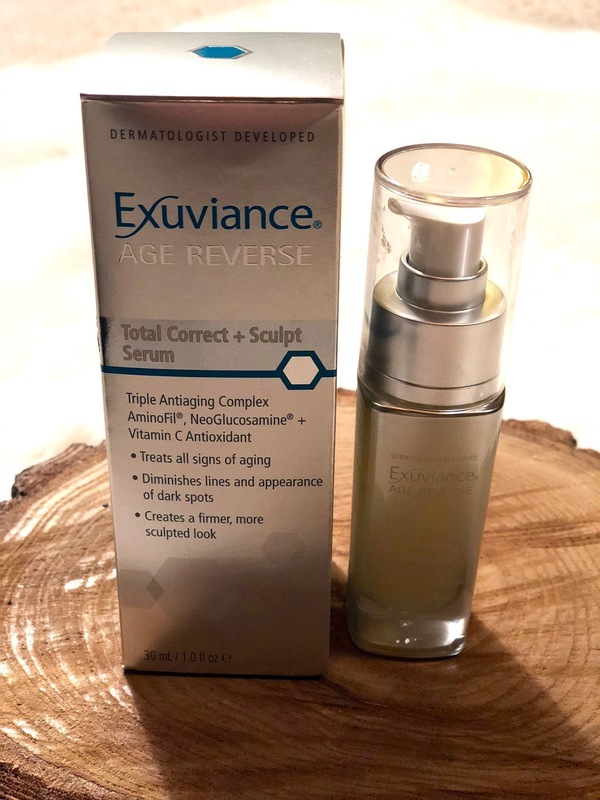 Since their ground-breaking discovery, the creators of Exuviance have continued to develop many new patented antiaging ingredients backed by evidence from numerous scientific and clinical studies. Recognized around the world, Exuviance formulas are expertly developed to visibly transform skin by combining their patented innovations with the best, state of the art technologies available in dermatology today. This serum is recommended to help those looking to address aging skin or a dull complexion. It is designed to help your skin achieve a firmer, more sculpted look, diminish the look of lines and dark spots with its Vitamin C Antioxidant, enhance exfoliation to smooth texture and reduce fine lines and wrinkles with NeoGlucosamine, and target collagen to help restore firmness and enhance volume with Aminofil®. It is formulated with a Triple Antiaging Complex of Aminofil, NeoGlucosamine and Vitamin C Antioxidant. This serum helps transform skin by addressing the signs of aging including dark spots, sagging skin, and uneven texture. To use, smooth this on after cleansing and toning and before your SPF/moisturizer. I used a pump of this morning and night after my toner and before my eye cream and moisturizer. It was easy to use with it's pump dispenser and I felt the amount was just right for my entire face. I paid special attention to my specific areas of concern (my forehead and laugh lines) when applying. I find it hard to see changes after only a week of use, but I do think it absorbed nicely and I certainly did not see any negative affects. There may have been some slight improvement to some fine lines/laugh lines on my forehead. I definitely plan to continue using the entire bottle. December was a busy month. I like to make quite a few gifts for people because I think handmade gifts can be so much more meaningful. They also take quite a bit more time though! I have a Cricut machine and with it, did some etched glassware, decorative plates, holiday pillows, personalized welcome mat, and a t-shirt. I also made some 4x4 snowmen and did a blanket with a collage photos of our Ireland trip this past summer for my in-laws. Those are the gifts I always get excited about giving. We are gearing up for Claire's birthday party next week. It always encourages us to get our Christmas decorations down pretty early. This year she has decided she wants a Trolls theme and I have some fun ideas I am doing for it! 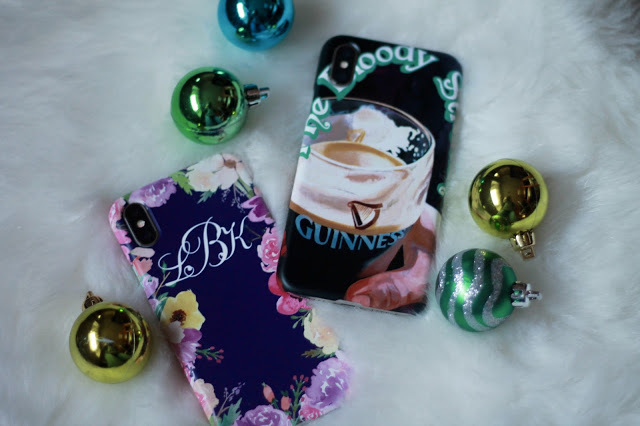 In the past she has chosen some unconventional themes that I've had to make a lot for so I am happy this year I get to buy some pre-made things and make it a little easier on myself! Before Christmas, I took the girls to the Shalom Wildlife Preserve in West Bend, WI. They have a fun Christmas drive-through that they decorate and you can see all the animals and the kids get small presents. Claire had so much fun! We drove to Candy Cane Lane, a local neighborhood that goes all out with their Christmas lights. The girls changed into pajamas and we loaded up the car with blankets and stuffed animals and spent an hour driving around oohing and aahing at all the lights. It was great! We got Aveline's first pictures with Santa! One of the local fire departments has pictures with Santa each year for a small donation and we love going. It is much more personal and I love supporting this local fire department much more than the Santa at the mall! And did I mention the lines are MUCH shorter?! I was fortunate that Matt didn't travel for pretty much all of September, October, and November. It was a record! But he is on the road again and had to go to a few places in December and has some travel planned for January and February. I don't know if I am ready to be 'single momming' it with 2 kids quite yet! Pray it goes smoothly for us! I got to do a little shopping at an outlet mall near(ish) to us at the end of the year. It seems to be tradition for Matt and me now. Bath and Body Works outlets are the best (Hello 75% off plus a $10 off $40 or more coupon) and I have enough lotion to last for years! I scooped up some deals at J.Crew Factory, too with a velvet peplum top and cozy turtleneck. I love their teacher discount! I can't believe it, but Avie is almost 2 months old! She had her 4 week check up a while back and was over 10lbs already! 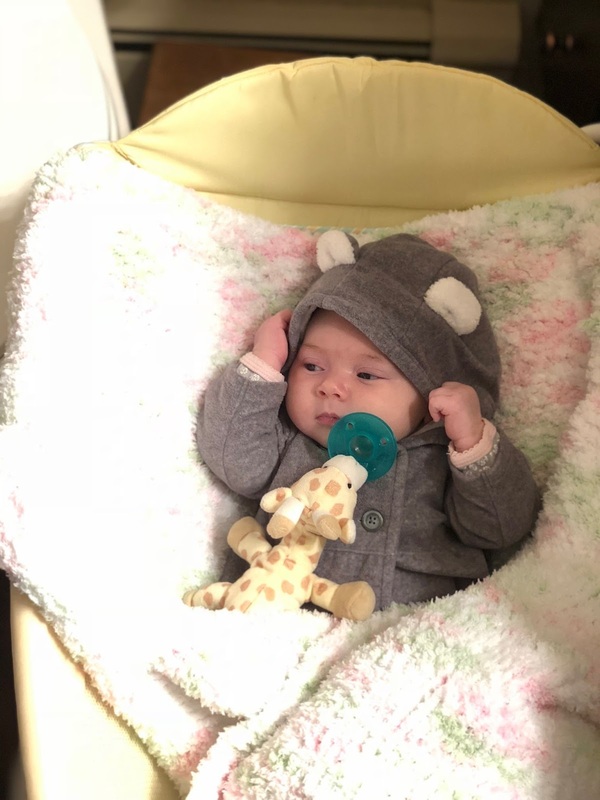 Poor thing got a viral infection soon afterwards and ended up with croup, bronchitis, and some thrush so we had to take her into Urgent Care and she was over 11.5lbs! Girl likes to eat! I think she carries it all in her cheeks. Haha! But in all seriousness, it's heartbreaking to hear her cough and her raspy cry and we hope she gets better soon. For now she is getting lots of cuddles. Oh no ho horrible your little one was sick! I hope she feels better quickly - it's so tough when they are unwell when they are so little! All of those recipes sound really good... always happy to add a good crockpot meal to the rotation so I'll definitely check that one out. Aww poor baby I hope she's doing better now! What a cool thing for a fire station to do, and I bet kids love that it's at a fire station (I know my son would!). Those recipes all sound so good too! So glad you did this review/recap post. I missed the crab Alfredo recipe so checking it out in just a sec. 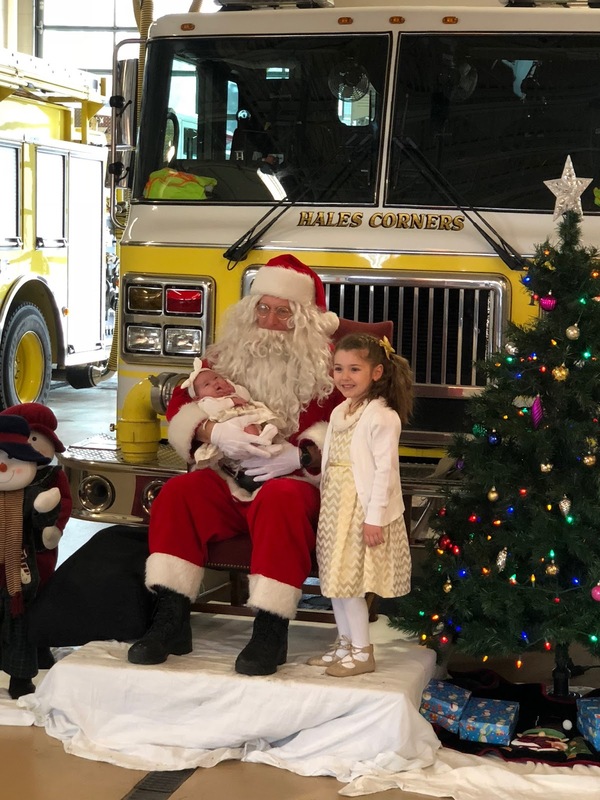 Love that your babies visited with a fireman Santa. So much better than Santa at the mall. Although, we lucked out with Lucia...found a hidden Santa with a real white beard in a little shopping center and best of all, no line! So sorry Avie has been so sick. But despite the croup and bronchitis, baby girl seems to be thriving. Chuckled at your comment about her carrying her weight in her cheeks! Precious. Prayers for you as you single-mom-it this new year. You are amazing and are so 'together' that it will be a cake walk. Just have a little wine on hand for an after-the-babies-are-in-bed unwind! I am so impressed with all you accomplish while mommin' those two beauties! I think when my kids were that small I never read, if course I may have if I had a Kindle back then, lol! Your girls are precious just like you! It's so lovely to see how Avie is doing and how you still spend some quality time with Claire!! I hope Avie is feeling better! So hard when they're so little and they get sick. They usually cut the budget near the end of the year, so my husband hasn't been traveling the last few months... but, I'm dreading it to start back up this year! I love hearing what recipes you've tried, it gives me some ideas. I can get so burned out on cooking sometimes! It sounds like you had a wonderful 2017! I love finding new recipes that other people love, especially when I am in need of some new things to add to my menu! So sorry your little one is so sick. It's not fun and can be scary at times when they have that nasty cough. You definitely have some yummy recipes there! 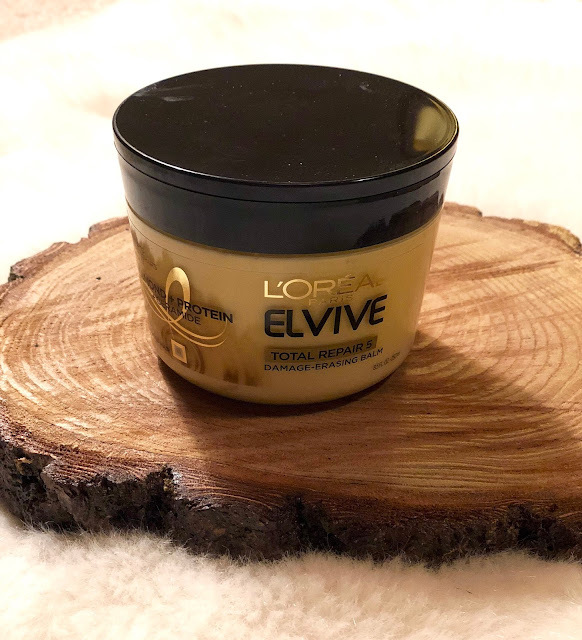 I love L'oreal Elvive Total Repair too. It's such a great product, and I absolutely love the scent. btw, Alvie is sooo adorable.